What is first check assessment procedures in import customs clearance? You are importing some goods from a foreign country. You would like to confirm all pieces and parcels are in order as well as the quality of goods is perfectly meeting with your specification provided to your foreign seller. Your overseas seller ships cargo as per the agreed terms and conditions between both of you and your buyer. Once cargo arrived in port of discharges, you arrange to file import customs documents to take delivery of goods. Once you have taken delivery of cargo from customs clearance, the term import procedures and terms of contract to ship the cargo ends. You will come to know the exact condition of goods only once the cargo arrived at your premises. However, you need to know the quality and quantity of goods before customs clearing the cargo. In this case, you can arrange ‘first check procedures’. What is first check procedures in Import? 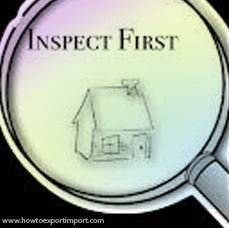 How to do First check procedures before completion of import clearance procedures by buyer . After filing Bill of Entry with customs which is the prime and legal document to file to complete import customs procedures, you can approach customs authorities for permission of ‘first check procedure’. Once you obtained permission for first check procedures, you will be permitted to draw samples of goods shipped by your foreign buyer as well as to arrange a surveyor to survey the goods. You can satisfy yourself with the quality and quantity of goods supplied by exporter. If quality meets with your requirement, you can continue to complete import customs procedures and formalities to take delivery of goods. If you have any dispute in quality, you can suspend in completing further import clearance procedures and formalities to take delivery of goods. You can inform your overseas buyer in this regard and you can stop proceeding further with completing customs procedures and formalities. Either you can reject the cargo or you can demand compensation with the overseas shipper based on your business relationship with your overseas supplier. I hope, I have clarified about First check appraisement in easy language to make you understand easily. Do you wish to share your experience handling First check procedures of assessment in import clearance? Would you like to add more information about this subject about FIRST CHECK APPRAISEMENT procedures and formalities in import clearance? Also read: How to know the quality, quantity or contents of goods before import customs clearance What is self assessment in import customs clearance in India? Is Risk Management System (RMS) simplify import? What is RMS in import. Write below your thoughts about this subject - What is first check assessment procedures in import customs clearance. Is Risk Management System (RMS) simplify import? What is RMS in import. MAKRAND SABLE: On 29 March 2014 THANKS. Navneet Lamba: On 13 April 2016 Re: First Check. I have read the procedures of first check as mentioend above, my only question here is basis the procedures that "If you have any dispute in quality, you can suspend in completing further import clearance procedures and formalities to take delivery of goods. You can stop proceeding further with completing customs procedures and formalities. Either you can reject the cargo or you can demand compensation with the overseas shipper based on your business relationship with your overseas supplier". In case consignee has rejected the cargo, then in this case what happens to the import Customs Duty DUE / Shipping Line discharge port charges and Container Freight Station movement/handling and container ground rent charge. Who will absorb the cost which have been already incurred by Shipping Line and Container Freight Station WELL IN ADVANCE. Awaiting your feedback on same. Tks/Rgds. Navneet Lmaba. Jagan Mohan M: On 18 July 2017 The procedures / formalities to be followed in importing / exporting materials of all kinds. What is Test Report in Import clearance? What is self assessment in import customs clearance in India? Can realization of export proceeds be in INR in India? How to Import to Botswana?